When shooting rimfire competition, even milliseconds can mean the difference between first place and second place. And while .22lr pistols and rifles aren't known for their muzzle rise, even a small amount of muzzle rise can make moving between targets quickly and accurately a challenge. 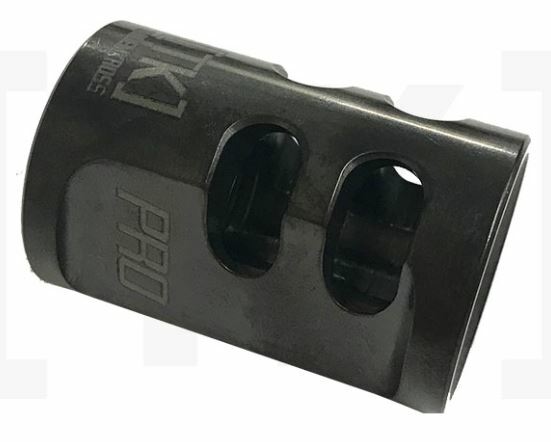 Introducing the new "Game Changer PRO" steel compensator from TANDEMKROSS - an ideal upgrade for any rimfire competitor looking to reduce muzzle rise and shoot faster and more accurately. Like our original physicist-designed "Game Changer" Compensator, the "Game Changer PRO" was designed to perfectly offset the .22lr cartridge. The compensator adds weight to the front of the pistol for better balance, reducing muzzle rise and improving accuracy when moving quickly between targets. The compensator vents gases at dual 45� angles for better visibility and control. Love shooting with a compensator but hate the clean up? The black "Game Changer PRO" features a proprietary Easy-Clean Coating to make compensator maintenance simple. The "Game Changer PRO" is easy to install, and fits any standard 1/2 x 28 threaded barrels.